*** Time for this post? Reading…10 minutes. Viewing…17 minutes. Considering…as you wish. Death. Dying. Have you noticed that most people dance around the subject of death when they’re in a situation that puts it in their face—whether it’s their dying or someone else’s. Obviously, I wasn’t prepaying for a funeral since I don’t know whether or not I’ll need their services. But he was willing to meet with me, on that understanding, to fill out the paperwork. There are some tricky questions on the forms that must be submitted when registering a death, and I wanted to make sure the correct answers are on file. Within minutes, it was obvious that the funeral director was selecting his words carefully in an effort to avoid causing me discomfort. Fair enough, in that we had just met and he was trying to assess where I was coming from. I helped him out by saying something very direct about my death that let him know he could speak freely. The conversation was much more satisfying after that. I think it’s our responsibility, as elders, to get over ourselves and any preciousness we may feel about dying. Shifting our mindset leads to more constructive behaviours, and we will be modelling a better way for our children, grandchildren, and perhaps also our friends. We Baby Boomers have grown up in a death-phobic culture in which dying has been sanitized and commercialized—like most of our life experiences. This has left us crippled, unable to handle death well. And that’s what our children and grandchildren are learning from us. This is the time for us to turn the tide—to learn what death requires of us and become comfortable talking about it. In a death-phobic culture, it becomes the norm to use euphemisms—substituting mild, indirect, or vague expressions for those thought to be offensive, harsh, or blunt. Legacy.com, which hosts more than 20 million on-line obituaries, lists the top ten euphemisms used in death notices. If ten isn’t enough, here’s a longer list. Somehow, the word “die” is culturally perceived as offensive, harsh, and blunt. Yet its actual definition is straightforward: To cease functioning, to stop living or existing, to undergo the complete and permanent cessation of all vital functions. Euphemistic expressions for death and dying have been described as “verbal tranquilizers” and I think it’s a fair description of how we attempt to avoid what are seen as harsh realities. …using the word “dead” makes it difficult to deny the reality. And, psychologically, while denial clearly needs to turn to acceptance, a little bit of denial is not all bad as a short-term coping mechanism. Indirect language can sometimes be a helpful way to mentally and emotionally handle your feelings gradually. She also points out that euphemisms may be used for reasons other than denial. These include protection, to avoid being rude or offensive, to avoid discomfort, to offer spiritual comfort, or because of our own grief. Her article highlights several considerations, including using euphemisms with children and principles for knowing when direct communication is the best choice. …When you should use direct language: The words death, dead, and dying should be used when it’s important to be very clear about what is happening. This includes when critical medical decisions are being made based on the prognosis of the patient, when speaking with those who might not fully understand indirect language, and when there might be a language barrier that might hinder understanding. The dinner table is the most forgiving place for difficult conversation. The ritual of breaking bread creates warmth and connection, and puts us in touch with our humanity. It offers an environment that is more suitable than the usual places we discuss end of life. This entry was posted in Conscious Dying, Conversations about dying and tagged death, dying, talking about death, euphemisms for death, Death Over Dinner, Michael Hebb, death phobia by Laurana Rayne. Bookmark the permalink. What a great read Laurana. I would like to attend some of these kinds of dinners and am happy to find that I would even be comfortable hosting one. People can choose to attend or not and it would be refreshing to sit and have open,honest conversations about death without ‘dancing’ around. 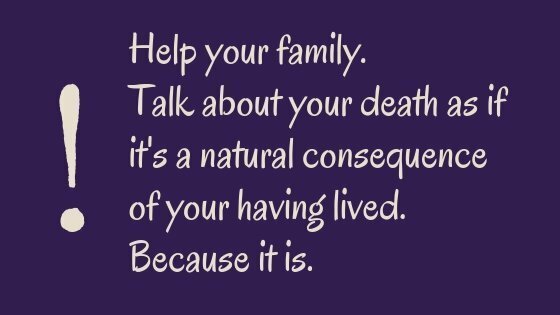 The topic has always caused me discomfort and my tendency to want to avoid it and those who are dying or grieving is bothersome. Also not being a fan of euphemisms, I appreciate this discussion and knowing more about when and when not to use them. Thank you for opening these doors. Very enlightening. So glad you found something in this for you. Thanks for being in touch, Susan.